Computer refurb nonprofit Free Geek pushes on with reboot at 1731 S.E. 10th Ave. When Free Geek started business in 2000, it occupied one scrappy room at 1731 S.E. 10th Ave. in Portland. Now the business has grown to accomodate 25,000 square feet. 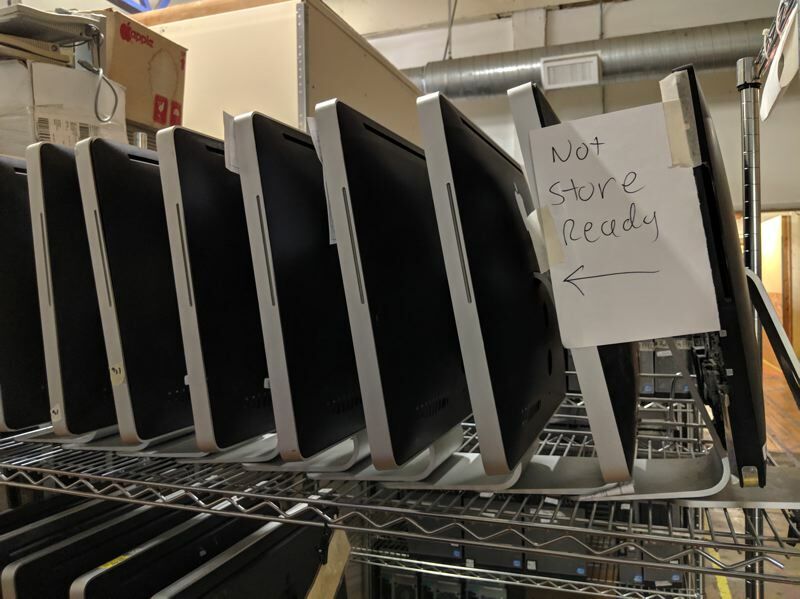 What was once the whole operation is now just the store where they resell donated and refurbished PCs and Macs, tablets and phones, for rock bottom prices. 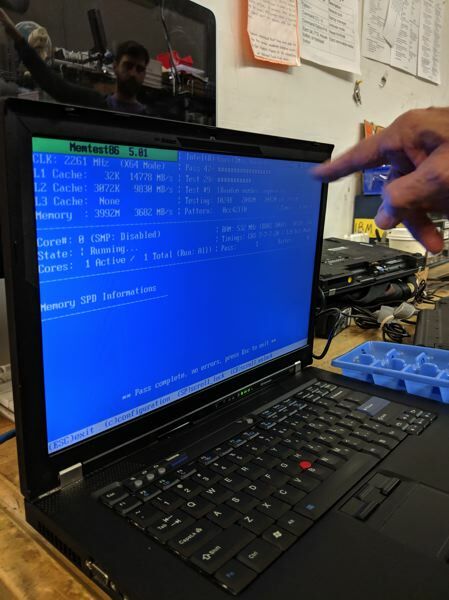 Staff in the SDA are trained to erase the data using software, and if they can't, they destroy the drive so the data can never be accessed by punching a dent into it. All the other items, without data, are sorted into boxes by volunteers. Giant tubs hold ribbon cable (the colored strips attached to old bus ports inside PCs). Others have tangles of power cables and data connectors. The bin for cathode ray tubes fills up every two weeks, says Bartholomew. "We recertify everyone that goes downstream," he says. They travel "downstream" to be taken apart and the toxic chemicals neutralized. The same with Styrofoam, which is notoriously hard to recycle: it melts easily into bricks, but many people do not want the inconvenience of driving such a bulky product around town to find a center. A compliance officer spends a lot of time certifying these partners and whom they do business with. "That's to make sure nothing ends up in the river, or China, or India." The monitor glass is made into tiles in Spain. The bin of steel parts (usually the frames inside tower PCs) fills up two to three times a week. Bartholomew is very proud that the whole place only fills its own bin of unrecyclable waste (for example, fast food scraps) every two or three weeks. Free Geek has 47 staff and there are 100 to 150 volunteers on premises most days. They use 2,000 to 3,000 volunteers a year, says Bartholomew. In the heart of the building there are racks and racks of desktop PCs. 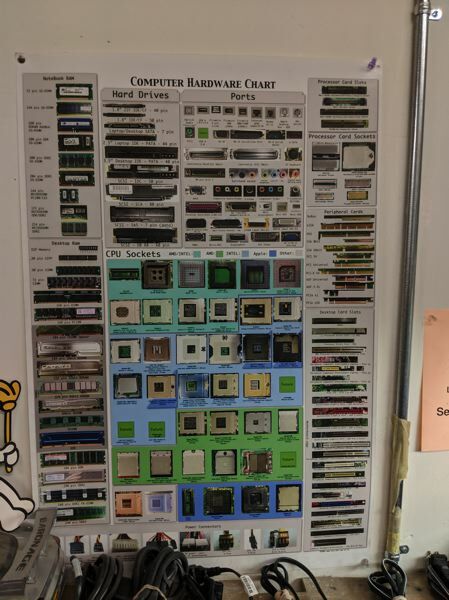 Many of them are obsolete and donated from Multnomah County (under a plan put in place in 2015 by commissioner Loretta Smith, the Multnomah County Office of Sustainability and Department of County Assets). They also take in old computers from the City of Portland and schools such as Reed College. Bartholomew likes such large donations because they are "consistent on their footprint." The machines are usually well-maintained, lightly used and very similar to each other, which makes refurbishing them easy. Computers owned by individuals are often older, having sat unused in closets for years, and have taken a beating. "I have three laptops from when I was 35 years old. They're full of cat hair!" He jokes. "That isn't true of corporate devices. They're maintained, well cared for, consistent." He gestures at a row of seemingly identical grey boxes which are ex-government desktop PCs. "You can see they're all the same device. We get pallets and pallets of them." As well as expanding into mobile devices in the last two years, Free Geek has increased its outreach. They've made it much easier for volunteers to earn a refurbished computer. "Now we grant (give free) a computer to anyone who does 24 hours of service to us. We also grant to students K through 12 that volunteer 24 hours anywhere in the Portland area, such as at a senior facility or a library." Grantees receive a Freekbox. This is a standard "stack" with a PC, a keyboard, a mouse, speakers and a monitor. It may not have the power to do high-end graphics, but it is refurbished and warrantied. In another area is a young staffer, Tayler Davenport, is refurbishing desktops. It's by no means a techie boys club. Women are well represented. 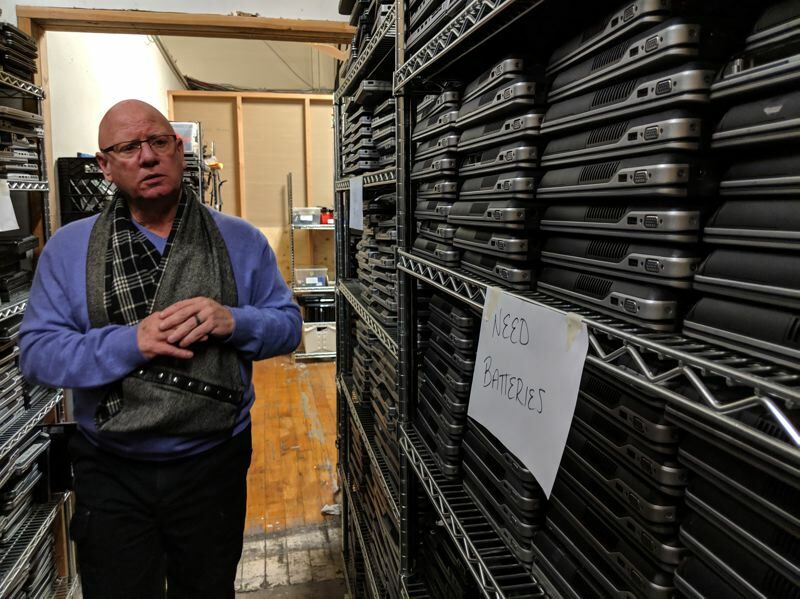 "We will open them up, add hard drives and RAM (random access memory), boot them, make sure everything's working properly and get them ready to go to the store, or to grant boxes or to Freekboxes for volunteers," says Davenport. The machines run Linux, the open-source operating system that Bartholomew likes to point out runs the International Space Station and the space shuttle. When someone is buying a PC from the store, Free Geek will install Microsoft Windows for $6 if they are classed as being "in need" and in the community. If they are not in need they pay just over $200 for Windows. That applies even on sales of say a $130 Dell 640-3, which goes for around $640 refurbished at the electronics e-tailer New Egg. In the store you can also find an iMac for $180. They have just updated their specs so the latest Macs are from 2010. Bartholomew explains the Free Geek way. "The key to digital inclusion is devices, education and tech support. We can give this (machine) to someone for $180. They get it home, it's going great and then it breaks. But if they purchased it from our store it has a six-month warranty. If we granted [at no cost] it, we give 12-months warranty." In the store, two of the tech support team always sit up front dealing with customers, answering the most basic questions. It's like the Apple Genius Bar, but without the high prices. 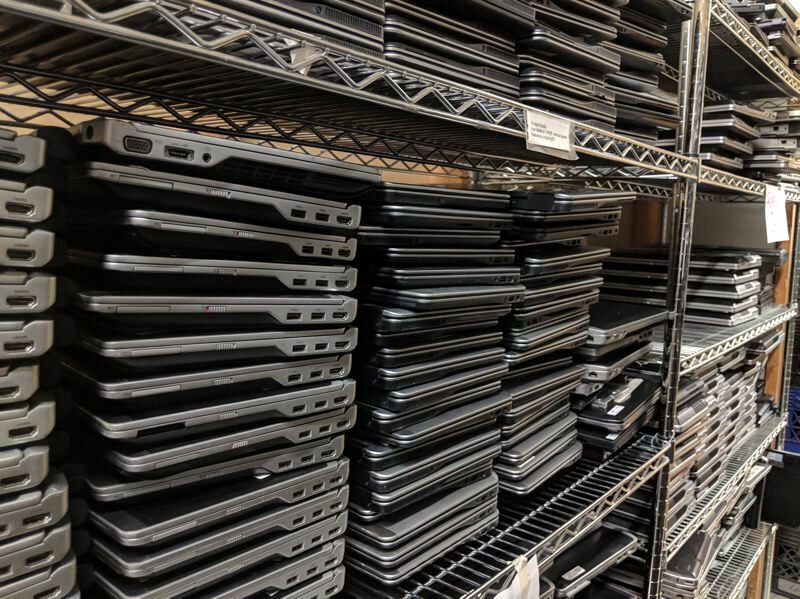 The other element, education, is also visible in the back room called the laptop reuse area. Free Geek tallied 6,000 hours of education last year, and offers over 400 courses. 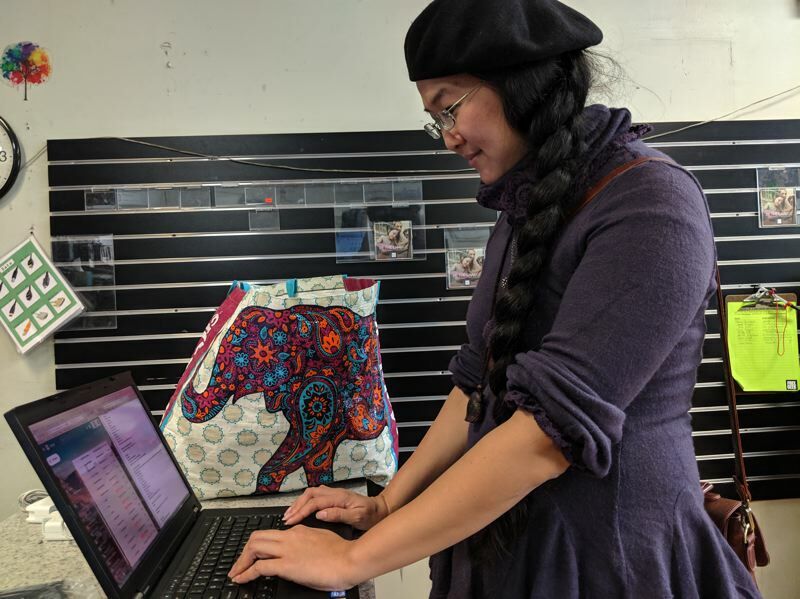 Most are on site, but they also get out and team up with Home Forward and IRCO to teach low-income people and recent immigrants how to use a computer. After five days they get one to keep. The laptop reuse area is one of many rooms that have a garage feel to them: workbenches are covered in torn open machines, and the walls are decorated with plans and stickers. Here several members of the public are working on the guts of old laptops. Scott Forbes is teaching the class, Techs Academy. "We have people from nine to 90, on all different realms of the spectrum," Forbes says. "Friday is geezer day, octogenarians and above," chips in Bartholomew. "A lot of it's social, or they want a computer. Somebody like Scott can teach you to get started. We have people who don't even know what a mouse is." Laptops are hard work. They deal with 1,200 a month. "Laptops, they change them every three months. Even though they look the same they may not be the same. The talent our staff has is to be able to say 'That's the Second Quarter Dell 6250.' "
Forbes explains why so many people are attracted to Free Geek: "TECHS Academy (is an) introduction to working on computers. It's a seven-part course. The first one is hardware, three are dedicated to desktops and three to laptops. They learn in a safe environment so they don't damage their own machines." Would they be able to turn pro after the course? "In theory would be able to repair common issues. In the end it's only 21 hours. We're trying to cram a lot of information in...Realistically I would expect anybody could make basic repairs, and do basic troubleshooting." A young man called John West, a reuse technician, is known as the Wizard of Testing. He can take pretty much anything — an oscilloscope, keyboards and mice, graphics boards and mother boards — power them up, test them and fix them. Bartholomew stresses attention to detail. Every component must be tested and made good. "If it's audio device, every single output must be tested. This is not Goodwill. (The customers) depend on it for their lives, for communicating with family back in Somalia, or look at their children's test scores. What comes out of here is real." The audio-visual section has its own secure area that even Bartholomew cannot enter. Mobile devices are complicated and fiddly, and have personal data, so they need specialists and locked rooms. The gear doesn't just go to volunteers and people who discover Free Geek's eBay and Amazon sites. Asked which nonprofits they work with Bartholomew says, "Mother & Child, any church in Portland, Habitat for Humanity has 50 of our computers..."
Is the selection process difficult for a nonprofit to have its office kitted out for free? "Not at all," he says. "It's an online form. So long as they're a 501 (c) 3 and not discriminatory or prejudiced, the turnaround is about a week." Bartholomew likes to put a human face on technology. "I was walking through this hallway and a woman of my vintage said 'Thank you for what you do.' I asked her how does Free Geek touch you? She said 'It's not me it's my son. My son is on the spectrum. He is brutalized and bullied everywhere he goes, he doesn't have any friends, so he stays at home and plays video games. Until we found Free Geek. "Now he comes here every day he builds Macs. He feels loved, welcomed, part of a community. And he does that every day in a Star Trek uniform." 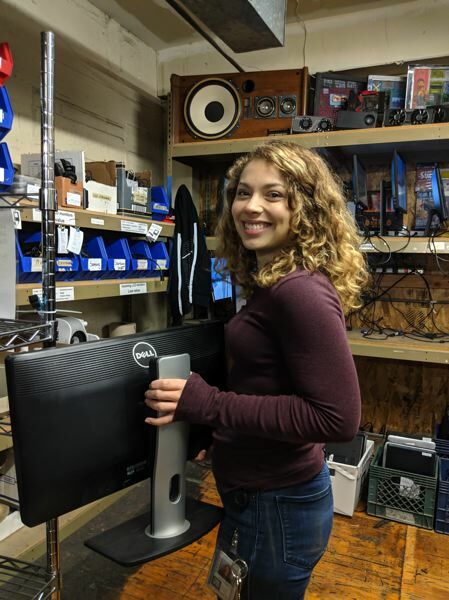 In the company store, Emily Wong was working on a computer ready to bring it to Eugene. "I work in tech support, but right now I'm working on a hardware grants program for nonprofit schools and faith organization. I'm working on one for A Family For Every Child in Eugene, which matches foster kids (and families). The grants program is for the infrastructure of nonprofits." They can request special items such as ethernet cables and USB flash drives. "Most of our organizations have budgets under $250k, limited or no IT support. We try to find a good match for them. Most of them are returning applicants, they need an upgrade." These are groups that still back up locally rather than to the cloud. "A lot of people are uncertain about the cloud, that would include me," says Bartholomew. 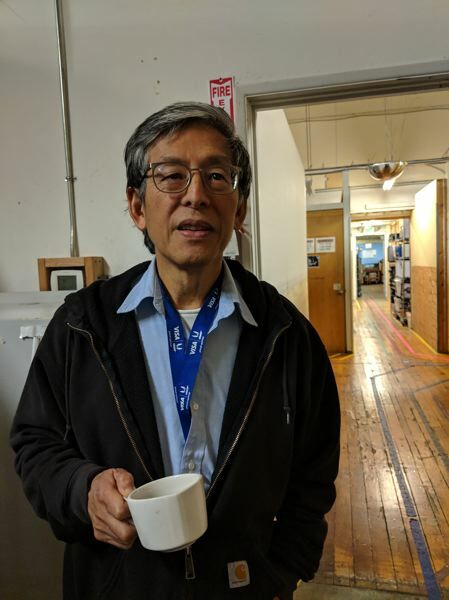 "The cloud is somebody else's computer," adds Wong. "Exactly. It's somebody else's computer," says Bartholomew. 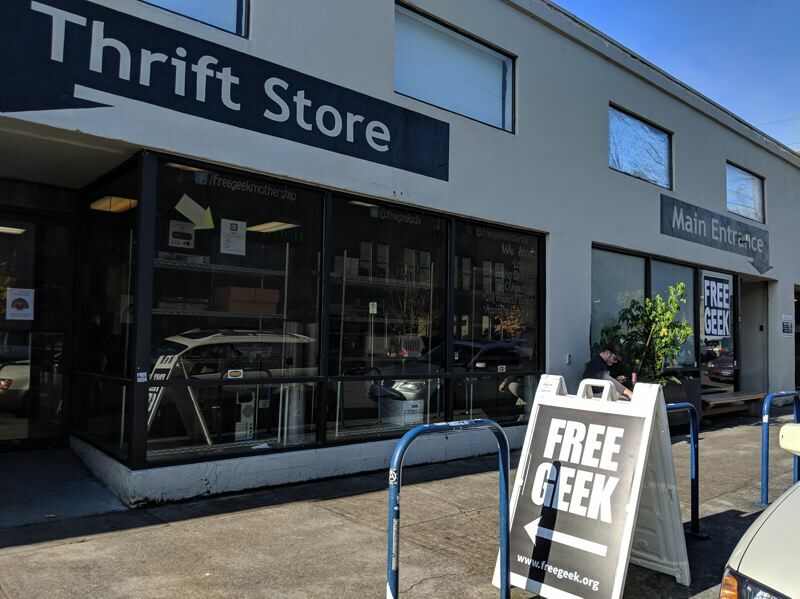 Free Geek was started on Earth Day in 2000 by Portlander Oso Matin. It was part of a community-wide public event at Pioneer Courthouse Square in Portland. It was "A beautiful idea," says Bartholomew. "Technology turns over about every 18 months, and there are hundreds of thousands of people that don't have tech. The idea was to point them at each other." Bartholomew moved here from Los Angeles in 2014, where he was a managing partner of Griffin Dunn LLC, which provides executive coaching and strategic consulting. He is fluent in diversity speak. Digital equity is one of his key phrases. "Everybody recycles now but that's become less of an issue than having to bridge the digital divide." He says 17 percent of people in the United States are not connected, and 39 percent of rural America. "That's a lot of minds that are not going into cleaning our water or curing cancer, doing the big things we should be doing." "I ask tech companies 'What are you doing for diversity?' They say 'We love diversity, we've got men and women.' I say 'What about the people of color, or the people from Russia who just got here? Where do you post your jobs?'" He takes issue with them just posting online to Indeed.com, because it excludes the 17 percent who aren't online. He estimates 10 percent of Oregon's population is not online, and in the Pacific Northwest, "that's a million households that are not connected to internet. And that's only households with K-12 children." Back in the Free Geek store, there's a steady stream of customers. A young musician is caressing a multitrack recorder. He's already shopped around. It'd be $160, used, online, $300 new. Here it's priced at $70. "This is a pretty good deal," he says. In a zone called Maclandia can be found an 88-year-old retired pastor, Jim Anderson. 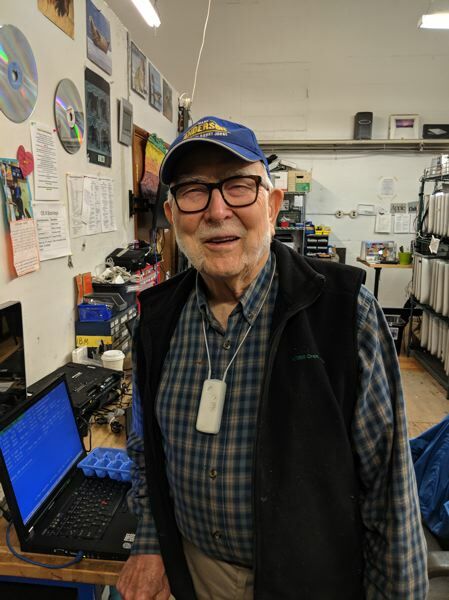 He's been coming to Free Geek for 11 years and is their oldest volunteer. He is fixing Linux laptops to send to underprivileged people in Africa. He has placed the computers in schools, nursing schools, a school for the deaf in Kenya and an orphanage in Zimbabwe. He has even placed some with street kids. He's working on an IBM ThinkPad, which he loves because it's such a solid build, it travels well. "This is not your $200 Asus," he says with a chuckle. "I compare them to finding a Mercedes 1997 in a barn in very good condition." The computers must be brought into Africa one at a time by tourists. The shipping for one by DHL would be $440. "For what's maybe worth $25," he says. Can he keep track of them? "I know everyone who's getting them, personally. but I don't know how many end up on the street. They all go to very responsible groups. But I have no way to track that or get them back." Another volunteer is Ying Yee. He has done 3,000 hours with Free Geek since starting in 2008. 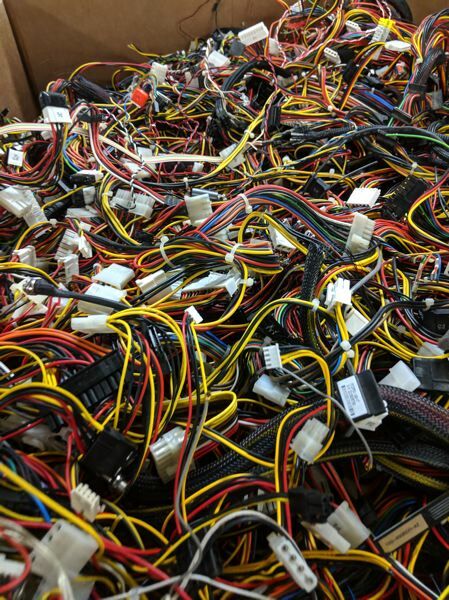 "This is a great program, there's so much computer parts going into the landfill, but a lot of parts are still usable." He was a medicinal chemist for over 30 years in big pharma firms such as AstraZeneca and Eli Lilly. He became a tecchie by default because computers were needed for everything from modelling drugs in ChemDraw to presenting them in PowerPoint. Retired now, Ying explained he was here to make amends. "As a chemist a long, long time ago, when you run a reaction, the sad thing is, you pour reactions into the sink. Until the late Seventies there were very minimal pollution controls. So now my motivation is, this is my penance for being a chemist with disregard for mother nature." Free Geek's mission is to sustainably reuse technology, enable digital access, and provide education to create a community that empowers people to realize their potential. At the turn of the millennium, Free Geek was founded to create digital equity through environmental sustainability. Computers help us in many ways, but the move toward a digital future isn't without its share of hurdles. Many individuals lack the resources necessary to purchase a computer or get the training required to use digital technology. At same time, the rapid pace of technology consumption and turnover means that over two million tons of hazardous e-waste is created each year in the United States. 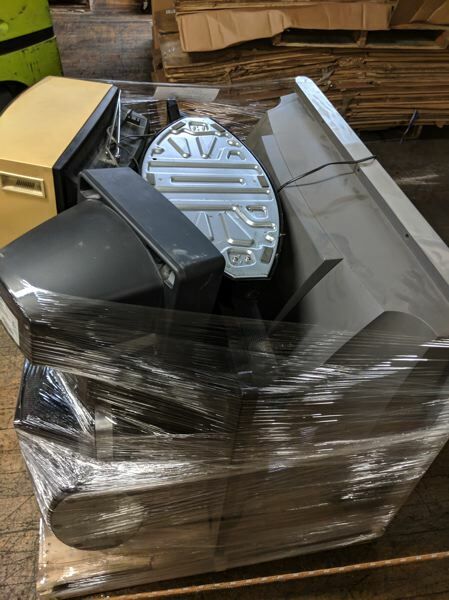 Free Geek's goal is to divert technology that would otherwise be recycled or thrown away, refurbish it, and give it back to our community at no or low cost. Address: 1731 SE 10th Ave.